We’re seeking donations to help us buy a set of musical instruments for our local primary school children to use. We want to buy the instruments ready for lessons in Term 3 this year (18 July 2017). Enrolling a child in music lessons is expensive, especially when lesson fees, an instrument, and books have to be paid for in advance. Hiring an instrument reduces these costs, making music lessons more accessible for families on low incomes. Children quickly grow out of correctly-sized instruments (e.g. violins). This way, beginner instruments can be returned to the Arts Council and hired out to other students. Performing music develops children’s physical coordination, analytical skills, teamwork, emotional empathy, commitment, and concentration. Children learn how to present themselves well in public, building confidence and self-esteem; while performing music from different eras and cultures broadens their understanding of society. And performing music with friends is fun! 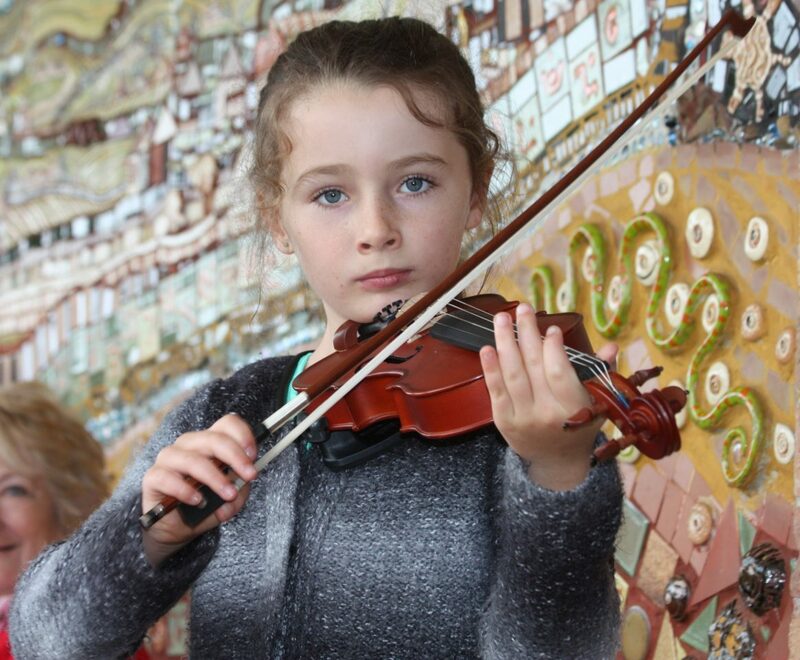 Local professional musicians have volunteered to teach weekly classes at Dorrigo Public School. Students can choose to learn violin, piano, or ukulele in small groups of 3 or 4 students. The program can accommodate up to 48 students. Classes will be free throughout Term 3, and will run in school time as part of the school’s elective program on Wednesday afternoons. Afterwards, parents will be able to hire instruments for children who would like to continue having one-to-one music lessons. The program builds on Dr Sheila Guymer’s very popular choir classes that provide an introduction to music using a Kodaly-based system and lots of musical games. The Arts Council hopes to run the instrumental program at other Plateau schools in the future. Donations will be used to buy four quarter-sized violins, and four half-sized violins ($420 each); eight soprano ukuleles ($62 each), and at least three electronic keyboards ($550 each). If we receive lots of donations, we’ll buy more instruments! The purchases include all necessary extras, such as a bow, case, strings, rosin, chin and shoulder rests for each violin; a case and set of strings for each ukulele; and a stand and pedal for each keyboard, plus packing and freight. Look up our website at www.artscouncilofthedorrigo.com, or contact the President, Sheila Guymer, on 026657 2375 for more information about the work of the Arts Council’s Music Committee. The Arts Council of The Dorrigo Inc. supports a wide variety of arts and craft activities on The Dorrigo Plateau. Established in 1982, although with roots tracing back to the 1900s, our current membership includes over 80 practicing artists. In 2016, we established Gallery 2453. Named after the postcode of The Dorrigo Plateau, Gallery 2453 provides a showcase for local artists and artisans. Each exhibition include painting, sculpture, woodwork, etching, photography, weaving and textile art, glassware, jewellery, and pottery. The Arts Council incorporates several special interest groups, each with its own calendar of activities: Dorrigo Visual Arts Group, Writers’ Group, Plateau Fibre Group, and a Youth Art Group. We hold two annual events: the Creative Mountain Arts Exhibition (held each Easter since 1987); and the Fine Arts Section of the Dorrigo & Guy Fawkes Agricultural Show (held each November since 1967). Our current President, Sheila Guymer, is a professional pianist. She is spearheading our new music program for primary school children. Sheila is Artistic Director of the Waterfall Way Concert Series, and runs Musical Memories, a music appreciation and well-being class for seniors.